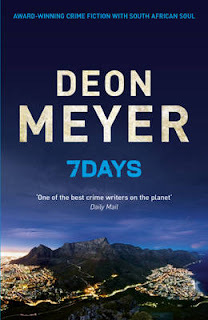 Today sees the UK publication of Deon Meyer's 7 Days, the latest in the (Captain) Benny Griessel series. Deon's previous two books, Trackers and Thirteen Hours were both shortlisted for the CWA's International Dagger. At the recent Harrogate Crime Writing Festval (HCWF), Jo Nesbo was asked what question would he ask his favourite authors and he replied: "Why do you write?". So that's my first question: Why do you write? Good question. And there is no simple answer, because the reasons have changed over the years. I started writing because the urge and need to do it (I’ve had it since my early teens) became overpowering, because it was the only thing I’ve ever been reasonably good at, because I wanted to somehow say ‘I’m here’, and, to be honest, back then, I also hoped being a writer would get me laid (it didn’t). Nowadays, I still write because of the never-ending urge, but also because I love being read, and I have a deep appreciation and gratitude for my agent and all the publishers who have invested so much in me. But most of all, I now write because sometimes, it is a real joy. You were asked by Barry Forshaw at HCWF whether you had a favourite character and you said it would be like trying to name a favourite child but do you think your readers have a favourite character - are you always being asked when's the new Benny/Mat/Lemmer - and if so why do you think that character is more popular? I love the fact that your books are linked by a "family" of characters eg with the main character in one book making a cameo in another - how did this come about? Was it planned or did it just develop? When writing a book, we get to spend eight or ten or twelve hours every day, month after month, with characters who don’t exist. And during this mysterious process, they slowly turn into real flesh-and-blood people. Perhaps because the subconscious can’t distinguish between actual and fictitious individuals when you live and breathe their thoughts, triumphs and tragedies so intensely, for so long. For me, they become like very good friends, or family members. After I’ve finished a book, I keep thinking about them, miss them, and (here is the barmy part) worry about them. That’s why they keep coming back. You act as an ambassador for your country (South Africa) when you're on tour - and I think you may be unique in this - have you considered getting into politics? Do you think your books are so popular in the UK because they provide a perspective on life in South Africa, or is is "just" because they are excellent thrillers? Thanks to my brilliant translator Laura Seegers, the only small difference is a few additional bits of information when needed to clarify matters for the international audience. And, of course, the glossary at the back of the book. And because Americans are slightly less familiar with South Africa, we added a few extra paragraphs in some of the US editions. Do you have anything to do with the translation process, eg discussions with the translator? Is there any author to whom you are regularly compared in blurbs, etc? If so, is this annoying? I’ve been greatly honoured by comparisons with John le Carré, Henning Mankell and Stieg Larsson. It’s never been annoying, always thrilling. This is one of the most difficult questions to answer, because I read and enjoy everything - from J.M. Coetzee to William Gibson, with everything in between. Growing up, I cut my thriller and crime teeth on the great masters: John D. MacDonald, Ed McBain, John le Carré, Frederick Forsyth, Ted Allbeury, Robert B. Parker ... And I still admire them all. Current authors I love to read and have huge respect and admiration for are Michael Connelly, Robert Harris, Ian Rankin, Dennis Lehane, Lee Child, Michael Ridpath, John Sandford, Val McDermid, George P. Pelecanos, Douglas Kennedy, Mark Bowden, C.J. Box, Anthony Beavor, Harlan Coben, David Morrell, Jeffrey Deaver, Ken Follett, to name but a few. Which (other) South African authors should we be reading? South African literature – and our crime fiction in particular – is blossoming. Chris Karsten, Mike Nicol, Margie Orford, Karin Brynard, Andrew Brown, Sifiso Mzobe, Peter Church, Wessel Ebersohn, H.J. Golokai, Joanne Hichens, Jassie Mackenzie, Malla Nunn, Diale Tlholwe … The list keeps growing. And finally...are you planning to write a book based on weeks, months, years, after 13 Hours and 7 Days! 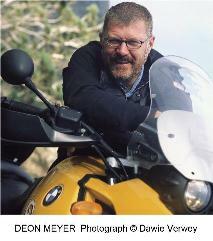 Many thanks to Deon Meyer and Hodder for arranging the interview. Fascinating interview! There have been one or two interviews with Meyer recently but you've thought of the best questions, it is especially interesting to read his remarks on the translation process.